Formal sitting position. Knees and ankles under the person sitting. 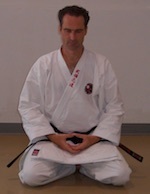 Here Shihan Henderson is sitting in Seiza, formal sitting position, during Mokuso.